Sulawesi is the most uniquely shaped island in the Indonesian archipelago, with four large, narrow peninsulas. Many people describe the island as either crab-shaped or orchid-shaped. 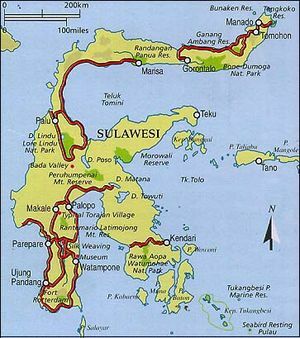 Sulawesi is between Borneo and the Maluku Islands, with the Philippines to the north and Java to the south. Sulawesi has six provinces: North Sulawesi, Gorontalo, Central Sulawesi, West Sulawesi, South Sulawesi, and South East Sulawesi. The central part of the island is very mountainous, making the peninsulas remote from each other (Wikipedia). North Sulawesi is predominately Christian. The largest ethnic group in the province is the Minahasa, who are protestant. This is one of the few areas of Indonesia where there is a church for every 100 meters of road. Off the coast of North Sulawesi is Bunaken, an underwater national park. West Sulawesi is a small province in the west-central part of Sulawesi. It split off from South Sulawesi in 2004 (Indonesia-tourism.com). The Bugis, Toraja, and Mandar call this province home. South Sulawesi is the southwestern peninsula. Makassar is the capital and is one of Indonesia’s most well-known cities. The Bugis make up over 40% of the population and the Makassar comprise 25% of the population. The remaining 35% is Toraja, Mandar, and other smaller ethnic groups. The Bugis are the dominant people group in Sulawesi. 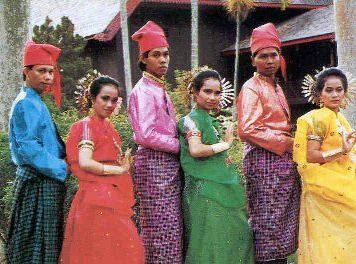 Two of the most important cultural values for Bugis are siri (personal honor) and siri-pesse (communal honor). A person must defend, maintain, and build his own siri. If a person’s siri is offended, serious forms of revenge will be considered.